Sleep apnea can affect individuals of all ages. The condition may go undiagnosed because physicians cannot detect specific signs of sleep apnea during a routine visit. In addition, there are no current blood test that can help diagnose the condition. In many cases, sleep apnea will cause a person to briefly snore (or snort) loudly then return to a stop-and-start breathing pattern. Sufferers typically feel tired, struggle with daily activities, and become moody or irritable even after a full night’s sleep. Without treatment, sleep apnea may increase the risk of heart attack, stroke, diabetes, heart failure, obesity, depression as well as motor vehicle collistions. There are multiple types of sleep apnea. 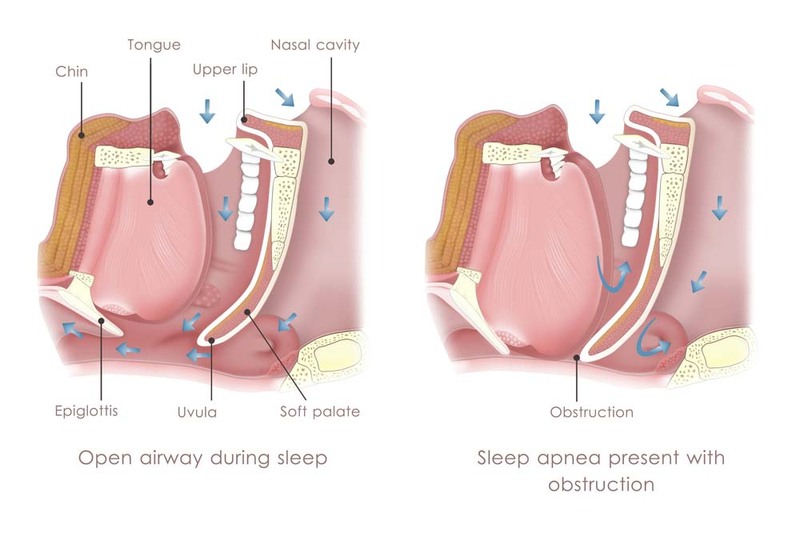 The most common form of sleep apnea is obstructive sleep apnea (OSA) where soft tissue in the throat relaxes to the point that an obstruction is created in the airway causing the airway to be blocked and therefore breathing to be momentarily paused. Dr. Page has significant experience in helping patients manage their OSA condition. She is a standing member in two organizations dedicated to treating this disorder: the Academy of Clinical Sleep Disorder Disciplines and the American Academy of Dental Sleep Medicine. Our approach at Page Dental Arts is to treat obstructive sleep apnea using oral appliance therapy (OAT). We start by carefully screening patients and, if we suspect a patient is at risk, we will recommend to the patient that they request a sleep study from their primary care physician (PCP). A sleep study is currently the only method of accurately identify and diagnose sleep apnea patients. We prefer to work closely with your PCP during a sleep apnea diagnosis as there may be underlying medical conditions the may need further evaluation. At Page Dental Arts, we rely on OAT to treat obstructive sleep apnea. We typically use appliances from Somnomed for your OSA therapy. These devices fit comfortably inside your mouth and restrict the tissue from obstructing your airway. The majority of mild to moderate sleep apnea patients can be successfully treated with OAT and we rely on the help of your PCP to determine the best treatment for you. Becoming a sleep apnea patient at Page Dental Arts is easy. All regular patients are screened for sleep apnea as a part of our normal protocol. If we deem you are at risk we will recommend a sleep study be completed with your PCP. If your sleep study results and your PCP recommends an oral appliance to treat your sleep apnea, then we can schedule a consult appointment to discuss treatment. If you are not a regular dental patient and/or are seeing another dentist and would like to be treated for OSA, request your PCP to complete our referralfrom and fax it to our office at (303) 948 5916, and we will schedule an consultation appointment. Your PCP may request a sleep study may be needed as this is the first required step to successful treatment. Kaiser patients only: We are an in-network provider for sleep apnea appliances for Kaiser patients. In order to schedule your first sleep apnea appliance visit, have your Kaiser authorization form sent to our office. Below are some helpful links that will provide additional information about sleep apnea and its treatment.